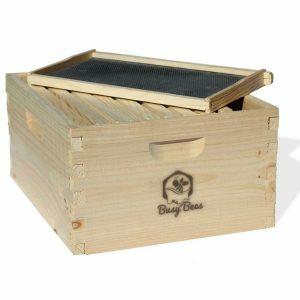 The Busy Bee’s -n- More Complete Langstroth Beehive Kit, made of high quality pine wood, provides quite a comfortable home for your bees. The beehive is the home of bees. Persons who desire to keep bees would therefore look for a beehive that will make a suitable home. Like humans, you most likely will not stay in a house that you do not feel comfortable in; it is the same with bees. Bees are usually gentle and easy going insects. They do not attack unless they feel threatened or disturbed. Disturbance and threat are of great concern to bees. They will not stay in home that isn’t convenient enough for them. This is why as a beekeeper, one of your main concerns should be how to get a safe, secure, and convenient beehive for the bees you keep. You also need to get one which will give you the maximum advantage and help you achieve your goal easily. You are to be on the search for a type of beehive that is large enough to give you your desired result. All the above and more are what you stand to get from the Busy Bee’s -n- More Complete Langstroth Beehive Kit. 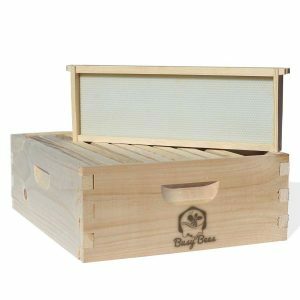 The Busy Bee’s -n- More Complete Langstroth Beehive is made of pure and high-quality pine wood. It is well and stylishly designed to be safe and convenient. Langstroth beehives are a preferred design choice by many all over the world. It is commonly the first choice beekeepers, especially beginners. The major advantage of using Langstroth beehives is that they allow for the easy removal of the honeycomb developed by the bees, thereby, making the collection of honey much easier. It is therefore a great choice for both new and old beekeepers. 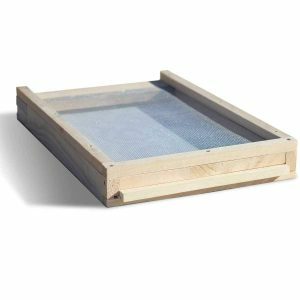 The Busy Bee’s -n- More Complete Langstroth Beehive is available in 8 or 10 frame configurations. Experienced beekeepers in the honey business will agree that the size of the beehive you use matters, so as to get the maximum honey bank throughout the Spring and Summer seasons. The flexibility provided by Langstroth beehives in this respect is what differentiates it from others. So let’s talk about your choice of frame count. That is, which one should you go for between the 8 and 10 frame boxes that Busy bee ‘n’ More offers. It is interesting to know that these are the maximum hive sizes generally available. And as I have said, as a beekeeper, you are to be on the lookout for the type of beehive that will benefit you and offer you the maximum honey harvest. Therefore, these two options are great ones. However, one reason you might want to choose the 8 frame box over the 10 frame box, is that the 10 frame box weighs more. It can, therefore, be difficult to carry. The 10 frame box is therefore a choice for those who do not worry about the carrying weight. Besides, it offers more honey making capacity. Includes a telescoping top cover, an inner cover and a screened bottom board. This beehive is hand made from Amish craftsmen in the USA. Includes 8 high quality pine super frames. Features 24 food grade plastic foundations, coated with real bee’s wax. Includes 10 high quality pine super frames. Features 30 food grade plastic foundations, coated with real bee’s wax. Its ability to expand. You have the option to place boxes on top of each other in order to expand the colony. There is a worldwide dimension standard for the Langstroth beehives. Every manufacturer of Langstroth beehives follows this standards. This makes it possible to interchange component form different manufacturers and it should fit perfectly. Whether 8 or 10 frame, the price is considerably affordable and provides great value for money. There is the challenge with the weight of the box, as stated earlier. Even the 8 frame box is itself heavy. Unfortunately, no instructions comes for assembly comes with the package. Also, boards do not come pre-drilled and nails are not included. The Langstroth beehive is divided into three major sections. Below section: this is the section that offers support to the all boxes of the beehive. It is the bottom board that carries the weight of the entire hive. It also functions as an entrance and exit point for the bees. It sits on the ground level. Some choose to place this bottom board on a hive stand or some other raised platform. It is never recommend to place the hive directly on the ground. Hive boxes: this is the action center of the whole beehive. It is in this section where the bees live, reproduce, deposit honey, and all others. The bees are housed in more than one box, which is what gives Langstroth beehives the upper hand because it allows you to add more boxes and expand the colony when necessary. Upper section: this is the part that covers the upper box. It is the very top of the hive. You remove this part when you want to add another box and then place it over the top of the box. From instructions on how to assemble a Langstroth beehive, you can click here. There isn’t any other note-worthy disadvantage to the Busy Bee’s -n- More Complete Langstroth Beehive Kit. It is surprisingly affordable and provides great value for money. You can choose to paint the outside of the boxes for added longevity.